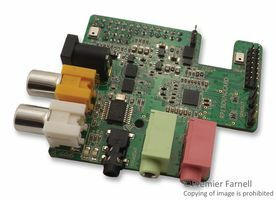 The Wolfson Audio Card, produced in collaboration with Wolfson, the premier mixed-signal semiconductor and audio solutions company, offers Raspberry Pi® users similar flexibility to a PC soundcard to capture audio alongside their camera, and experiment with stereo digital capture and playback. Currently the Raspberry Pi, whilst being equipped with audio capability, is limited in a number of ways.The limitations are purposeful, in order to keep Raspberry Pi at a low price point. This audio card then offers multiple types of input sources and outputs.